The first book in the Amish Homestead series, *A Place at Our Table *invites us to a quiet community in Lancaster County where love burns brightly no matter the cost. First book in An Amish Homestead Novel series! 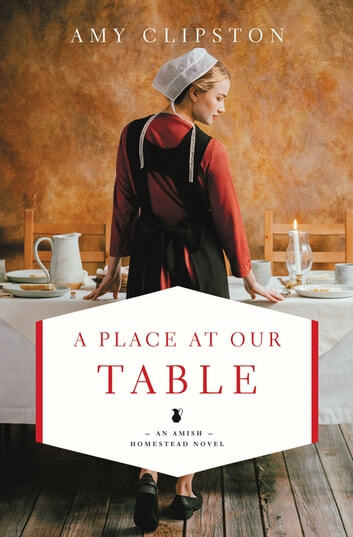 A Place at Our Table by Amy Clipston is the first An Amish Homestead Novel. Kayla Dienner lives in Bird-in-Hand, Pennsylvania with her family. They are awakened in the middle of the night when lightning strikes their barn setting it on fire. James Riehl is one of the volunteer firefighters who responds and he is smitten with Kayla. Kayla, though, does not appreciate James encouraging her younger brother, Nathan in signing up for volunteer firefighting training. The Dienner family lost their oldest son, Simeon while he was serving as a volunteer. Kayla is attracted to James, but she is not sure she is willing to risk her heart again. After several chance encounters, James starts to court Kayla. Then a tragic accident happens upsetting James and his plans for his future. Kayla becomes frustrated and pushes James away. Is there a chance for these two to have their happily-ever-after? A Place at Our Table is well-written and has a good pace. I thought the characters were well-constructed and realistic. I was immediately drawn into the story and it held my attention until the very last page. There is heartache, love, grief, anger, forgiveness, grace, fear, guilt and regret in A Place at Our Table. I also appreciated the messages regarding God’s will, power of prayer, and His has plans for each of us. It is lovely to see how an Amish community comes together to help their neighbors. It is a shame there is not more of this in our world. I enjoyed the Amish volunteer firefighter angle. This is my first Amish novel with this theme (very unique). A Place at Our Table is a heartwarming as well as heartbreaking story. I look forward to reading the next An Amish Homestead Novel (Room on the Porch Swing) when it comes out in the spring.